JACOTECH PLATING ADVANTAGES: CURRENT TRADITIONAL INDUSTRY METHOD OF COPPER PLUS POST CHROME PLATING, AS COMPARED TO THE NEW AND ADVANTAGEOUS JACOTECH DIRECT ENGRAVABLE PLATING (NO POST CHROME FLASH PLATING). It is a known fact in the lenticular extruding industry today, that the current traditional method of supplying lenticular extruding cylinders consists of applying a soft copper base plating onto a steel green base cylinder surface, which is then diamond turned and engraved. After the lenticular engraving, a post chrome thin-flash plating is applied on top of the copper engraved plating, only to help protect the soft copper finish underneath from oxidation and staining. The post chrome plating does very little to protect the copper lenticules from damage or wear while extruding. Copper begins to oxidize (change color) after engraving, (must be post plated quickly). Copper is also easily susceptible to staining, which can transfer into the lenticular lens material as a stain or artifact. Chrome plating has inherent micro-cracks within the final plated finish (creates shorter cylinder life), and chrome does not deposit evenly in thickness across the cylinder width. This fact can alter the quality of the lenticular lens materials across the master lenticular roll width. Post chrome flash plating begins to wear quickly, and later can detach portions of itself from the copper engraved plating after short use, which then begins to stain the lens. This condition occurs especially when extruding with acidic type resins, such as PVC. This condition can render the cylinder useless, and then must be re-worked more often. Extruder production ceases and causes unnecessary delays and more expenses for the extruders. Post chrome flash plating can alter the intended optical lens design by adding an undesired thickness to the copper engraved lenticules. The addition of chrome plating on top of the copper engraved lenticule changes the desired "knife-like sharp peaks" of the lenticule profile to a more rounded undesired profile. The chrome post plated lenticule profile develops a "land area" vs. a "knife like sharp peak" lenticule. The chrome plating effectively can change the intended optical lens design negatively, which can create possible quality problems once printed upon, or when viewed as a computer or TV screen. JacoTech plating is much harder and durable (longer cylinder life), and will not damage as easily as copper. JacoTech plating has a Rockwell C hardness level of approximately (50-52 C) - almost three times harder than copper. After engraving, JacoTech plating will never be susceptible to staining, and will not transfer stains into the lenticular lens material, assuming the cylinder surface is cleaned properly during and after extrusion production. JacoTech single-ply integrated plating requires no post plating and is applied sufficiently to the green base cylinder for best durability. JacoTech plating offers much better protection from nicks, scratches and from normal handling of the cylinder as compared to soft copper. JacoTech plating has an excellent optical surface finish and is evenly consistent across the entire cylinder face width. This fact will help insure the quality of the extruded lenticular lens materials. JacoTech single-ply integrated plating will not stain or detach itself from the steel green base after long use, especially when extruding with acidic type PVC resins. 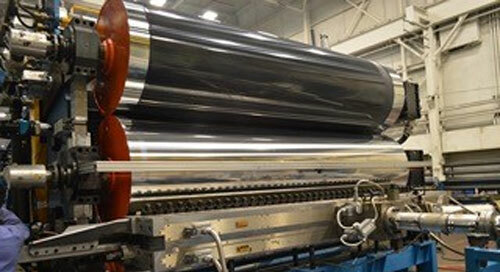 Extruder production is higher and lenticular extrusion production remains profitable. JacoTech plating will not alter the intended optical lens design because we directly engrave the perfect optical design profile exactly as desired into the JacoTech plating. JacoTech plating does not require a post plate of any kind. By engraving directly into the JacoTech plating, we maintain a "knife like sharp peak" lenticule profile, which allows for the best optical performance vs. obtaining an undesired "land area" that will form when using the old post-chrome plating method, which can alter optics. JacoTech plating will also allow for the proper and intended optical lens design to work once printed upon, or when viewed as a computer or TV screen. By using state-of-the-art JacoTech patented optical lens designs, patented diamond tools, single-ply direct engravable proprietary JacoTech plating and advanced precision CNC diamond turning technologies, we help save the extruder time and money within their manufacturing facility. These JacoTech advantages also help the end user client enjoy the highest quality lenticular lens product that is available within the lenticular industry today. Engraving into Copper, Aluminum, Electrolytic/Electroless Nickel/Alloys, Beryllium Copper, Brass, Gold, and other custom materials. ADDITIONAL JACOTECH ADVANTAGES: PATENTED AND PATENT PENDING "LENTICLEAR" ASPHERIC/ELLIPTICAL LENS & TOOL DESIGNS USED FOR HIGH PERFORMANCE LENTICULAR LENS ARRAY MATERIALS BY PLASTIC EXTRUDERS. NOTE: The following schematics and explanations illustrate the numerous advantages of the new patented and patent pending LentiClear aspheric/elliptical lenticular lens, versus the typical industry standard cylindrical lenticular lens that uses prior art and much older technology. 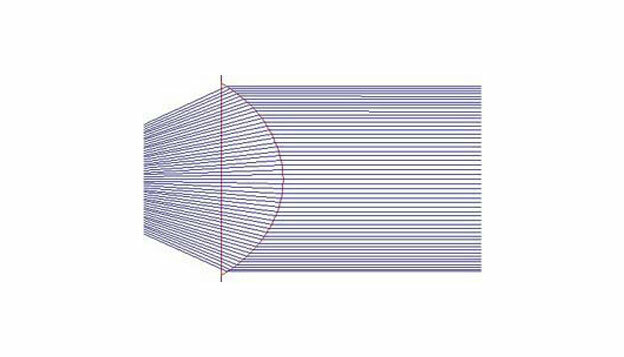 As you can see from the above illustration, the industry standard lenticular lens uses a cylindrical shape. (Note: The print material is located to the left of the lens and the view is located to the right. For best performance, all of the light rays exiting the lens should be parallel or collimated). 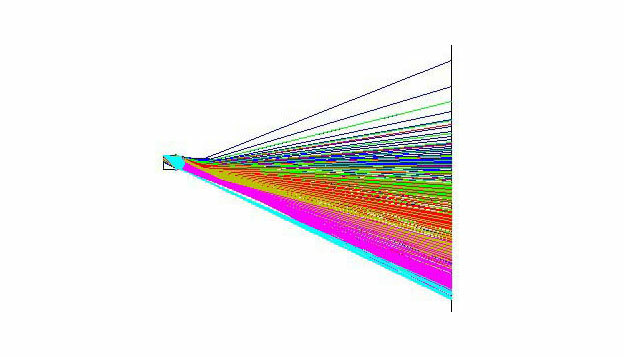 Due to a spherical aberration, only the rays in the central portion of the lens exit in this desired manner, while the rays farther from the center begin to significantly change from the desired direction. As the light rays reach the outer portion, the light can be seen to internally reflect, which ultimately returns the highly defocused light to the print material. This reduces the overall light output, brightness and contrast of the image when viewed through the lenticular material. The new LentiClear lens (see above illustration) overcomes the shortcomings of the standard lenticular lens by utilizing an optimized aspheric/elliptical shaped lens that effectively collimates the light from the printed material. The light is well collimated, no light is internally reflected, and the full aperture of the lens is used. The enhancement in contrast, clarity, and brightness afforded by the new LentiClear® lens brings sensational improvements and added opportunities to the entire lenticular industry. 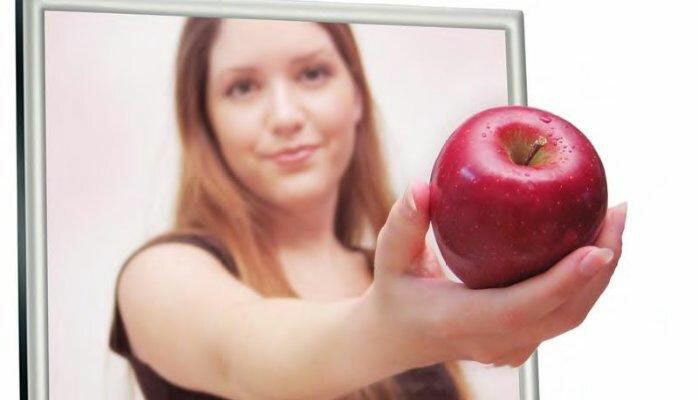 Now, compare images projected from several points on the printed material by the industry standard cylindrical lenticular lens versus the new LentiClear® aspheric/elliptical lenticular lens. 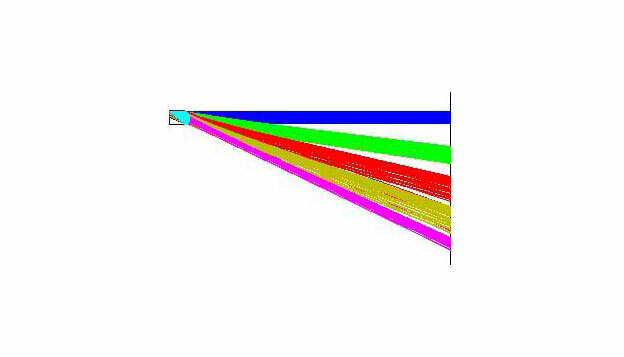 The excellent performance of the LentiClear® lens clearly demonstrates that the light from the points is essentially collimated and forms well-defined and separated beams. On the other hand, the performance of the industry standard cylindrical lenticular lens illustrates that light is poorly collimated and the light from different points on the printed material is intermingled. This causes the projected images to have dramatically less clarity and contrast than images produced using the new LentiClear® high performance lenticular lens. The new LentiClear® lenticular lenses also provides a much wider field-of-viewing angle, as well as providing brighter, clearer and better contrast images than the typical cylindrical lenticular lenses. JacoTech utilizes and offers our newly patented, aspheric/elliptical state-of-the-art optical lens design, JacoTech proprietary direct engravable plating (with no post chrome flash plating required), patented diamond tools, and precision single point CNC micro-machining process for all of our JacoTech lenticular cylinder customers. Learn how we will save you money within your lenticular extruding manufacturing plant (as compared to your current source) when using the new advanced JacoTech cylinder technologies. JacoTech guarantees that we will furnish you with the best quality cylinder surface finish and longest lasting engraving life that is available on the market today! Please call Dr. Gary Jacobsen today to discuss pricing of your particular standard or custom lens design and cylinder engraving applications. Large contractual volume based discount pricing programs are offered, please inquire if applicable. JacoTech's advanced optical lens profile engraved cylinder molds help optical film extruders/casters manufacture the best defect-free optical sheets with high-performance optical imaging qualities used for OLED, LED, 3D/4D TV displays. We are experts in custom optical lens design engineering for any resin and we CNC diamond turn/mill/fly-cut/angular/circular engrave micro-structured optical lens patterns for the management of light. We ship around the globe. Quick turn-around and emergency mold repair is offered. Prismatic V-Grooved Patterned Engraved Casting Cylinder. The photo shown is one of our diamond turning machining centers, taken with a camera flash which illustrates its brilliance in reflective optical properties. The optical pattern features a shallow 0.0005" (5/10 thousandths of an inch) into a diamond turned mirror-finished optical grade copper plated roll. The cylinder will yield high quality uv resin casted high reflectivity thin-lens film used for integration into cell phone and display monitor screens. The technology can be used for other light control management applications. 75 lpi Lenticular Production Cylinder. Here's an actual 75 lpi lenticular production cylinder engraving close up image of JacoTech's ultra-precision 360 degree circumference step and repeat diamond turned engraving. The secret to an essentially perfect defect free lenticular lens sheet is first having a properly manufactured engraving. The mold tolerances must be consistent and repeatable over the entire roll face. Assuming a roll face width of 66" x 75 lines per inch = 4,950 lenticules, during engraving production the diamond tool travels 475 miles, if measured in driving distances. JacoTech provides new Custom Light Pipes for plastic extrusion processing of thin-gauge volumetric lens sheet & roll manufacturing. These transparent polymeric lens/foils are used as light guides to direct light and scatter rays as desired for end lighting products. The optically functionalized light pipe lenses structure are typically made of acrylic and PMMA resins by large area hot-embossing. JacoTech's new offering allows the extrusion process to fabricate the light pipes in thin-gauge to save money and increase production, thus lowering overall product costs of lighting companies. JacoTech's advanced lenticular lens array engraved cylinder moulds help lenticular extruders manufacture the best defect-free lenticular sheets with high-performance optical imaging qualities. 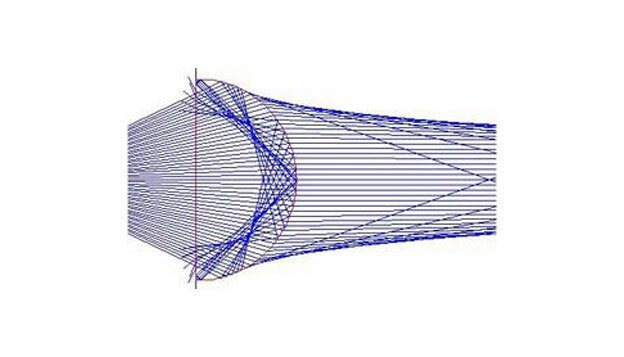 We are experts in custom optical lens design engineering for any resin and mechanical CNC diamond turn/mill/fly-cut/angular/circular engraved micro-structured optical lens patterns for the management of light. We ship around the globe. As lenticular experts in optical lens designs and microstructured cylinder diamond engraved mold patterns used for plastics sheet/roll materials processors, JacoTech provides the world's best lenticular cylinder engravings for high performance extrusion & optimally correct lens array material sheet production.